Radio from an early age has been a real passion. I was given my first radio at the age of 4 and grew up listening to the offshore Radio Caroline in the 70s and 80s along with Laser 558. I love most types of music but especially music of the 60s and 70s. I gained my Amateur Radio licence in 1989, my Ham Radio callsign is G7EIA. When I'm not on Cabin FM on a Sunday and Wednesday evening you might catch me talking to radio contacts from around the world. I have lived in Herne Bay for over 17 years and am married to my wife Angela, and a have son called Samuel who is 10 years old and has Down syndrome. 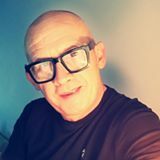 Come and join me for my show 'Across the Decades' where I delve deep down into the Cabin FM record library playing music from the late 50s to today each Wednesday evening 21.00 to 23.00, and 'The Sunday Wind Down' every Sunday 20.00 to 23.00.